One of the most inspiring names in Rugby today, Heather Fisher not only boasts achievements on the pitch as a World Cup winner and an Olympian but off the field too. The Team GB and England Rugby 7s player is also a motivational speaker and athlete mentor. Starting out in rugby at the age of 16, Heather joined Britain’s Women’s Bobsleigh team in 2006 but returned to rugby after three years to follow her dream of playing the sport internationally. 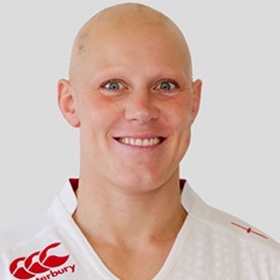 Heather went on to play for the England 7s in the 2009 World Cup and in 2010 World Cup for the England 15s and has continued to represent both – the pinnacle coming in 2014 when she achieved gold in the women’s World Cup. 2016 has seen more elite achievements, with Heather representing her country at the Rio Olympics – playing a pivotal role in Team GB reaching the Bronze medal match. In addition to her achievements on the pitch, Heather shares her strong philosophy and values of how to achieve your full potential with young athletes and individuals across the country via motivational speaking appearances, her training consultancy business and in her role as athlete mentor for the Sky Sports Living For Sports programme.